Introduction: The goal of this study is to determine the safety and efficacy of the Ligasure vessel sealing device as an alternative means for the division of tissue bundles, vessels, and vascular pedicles in gastrointestinal surgery. Methods: Data was prospectively collected for consecutive colon and small bowel resections performed from October 1998 to January 2010. Standard descriptive statistics were performed. 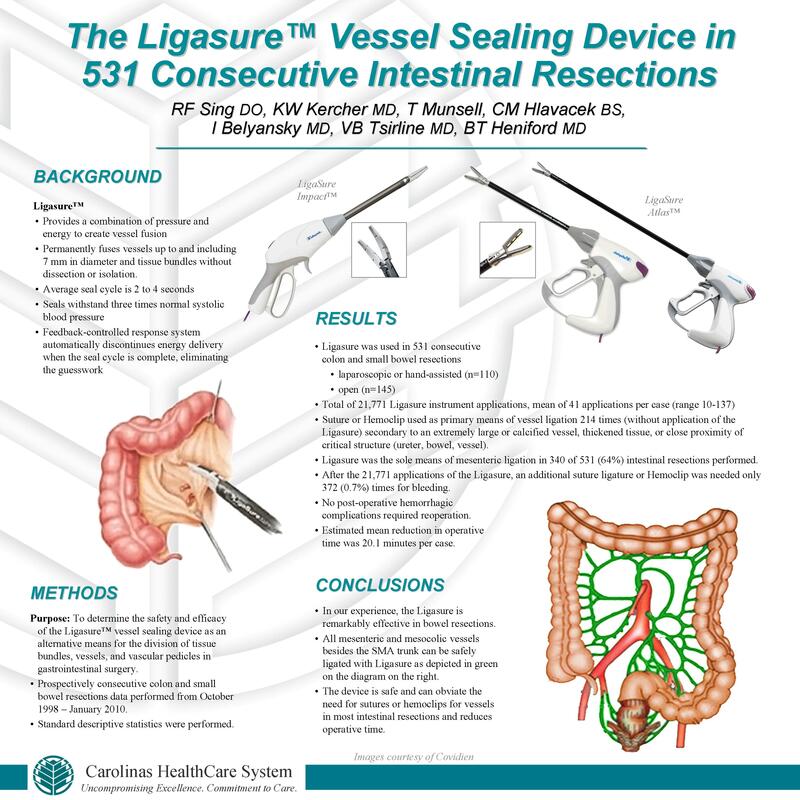 Results: The Ligasure was used in 531 consecutive colon and small bowel resections (laparoscopic or hand assisted n=110, open n=145). There were a total of 21,771 instrument applications with the Ligasure for a mean of 41 applications per case (range 10-137). A suture or Hemoclip was used as a primary means of vessel ligation (without application of the Ligasure) only 214 times secondary to an extremely large or calcified vessel, thickened tissue, or close proximity) of an anatomic structure (ureter, bowel, vessel). The Ligasure was the sole means of ligation in 340 of the 531 (64%) intestinal resections performed. After the 21,771 applications of the Ligasure, an additional suture ligature or Hemoclip was needed only 372 (0.7%) times for bleeding. No post-operative hemorrhagic complications required reoperation. There was an estimated mean reduction in operative time of 20.1 minutes per case. Conclusions: In our experience, the Ligasure is remarkably effective in bowel resections. The device is safe and can obviate the need for sutures or hemoclips for vessels in most intestinal resections and reduces operative time.